© Nisha Abdulla Nisha Abdulla is a playwright and director based out of Bangalore. She began her artistic journey with writing shorts, as well as training and performing in Playback and Theatre of the Oppressed, followed by acting roles in both classical and devised productions. In the last few years, she has focused entirely on playwriting and direction. Her playwriting credits include Mi’raj (produced by Indian Ensemble Studio), Blue is the Color I cry (long-listed at The Hindu Playwright Award 2017), Big Pink Sky (a play for young audiences). 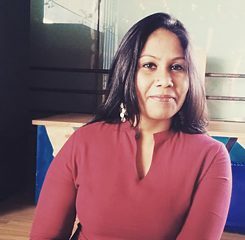 Her directorial credits include Ashk Neele Hain Mere (performed in Hindustani), and Orchestra on the Moon (an experiment of physical theatre and text in, English). She is currently writing-directing The Battle of Waterloop, a play for young audiences performed by students of Head Start Academy. Theatre for Youth is a continuing area of interest for Nisha. Apart from writing and directing plays for them, she also conducts workshop programs in storytelling, writing and theatre as well as develops pedagogical interventions that use stories and theatre in education. At Schauburg Theatre, she will be exploring the formative role that myths play in culture and identity building through the medium of plays, both classic and contemporary, across languages and culture.